Anarkali suits have made an unstirred place in the world of ethnic wear. From North to South, East to West, the love is pouring tremendously. But there are some nondetachable strings attached to Anarkali suits that many of you might not know. Anarkali the name says it all, but not many of you might be enlightened about the rich history shared. Anarkali was the courtesan at Mughal Emperor Akbar’s court. She was captivating and her beauty is described correct to her name Anarkali means pomegranate blossom. She has a dewy glow and enthralling presence that made crown Prince Salim fall for her. They shared an impeccable love story that is uncanny to many and hardly share any place in many historic books. Though the world has to know about her, and the release of movie Mughal-e-Azam finally shared a love story that was eternal though could not end on happy notes. Yes, as said Anarkali was buried alive behind two walls by the orders of Mughal emperor Akbar. And here came the origin. The very famous outfit that Anarkali used to wear was of frock pattern with ample of silhouettes gathered near the bust line and make a ravishing flow right to the bottom. Anarkali suits, therefore, it is called. In between disputes among scholars on the authenticity of Anarkali’s incident, what cannot be disputed and shared is the origin of Anarkali suit, rest is history. The first thing that makes home in the mind is the quality that denotes Anarkali. Anarkali or pomegranate blossom is soft, blush, bloom, and enthralling. Therefore, a woman who wears Anarkali suits look no less than a gorgeous diva whose beauty blooms by adorning Anarkali suits. It will be high note interesting to know that the Anarkali churidar worn by the courtesans in the Mughal era are transformed brilliantly to what we have today. The gorgeous Anarkali comprised of a streaming dress which is the top and finished by a tight churidar alongside a long coordinated scarf called chunni or dupatta. 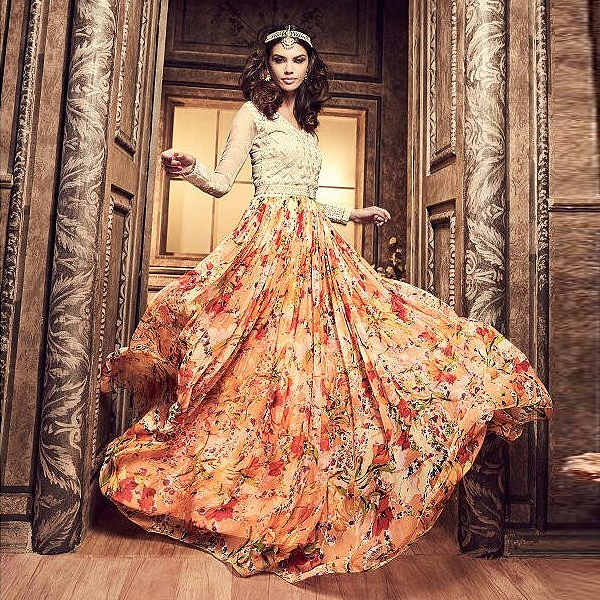 Today, they are leading Indian Designer Wear and have transformed to look magical. Unlike other suits and Indian ethnic wear, Anarkali suits have a distinctness to offer. They come in various styles putting the world head over heels with this trend. Available in various lengths from knee length to floor length, the fashion industry cannot get over with it. 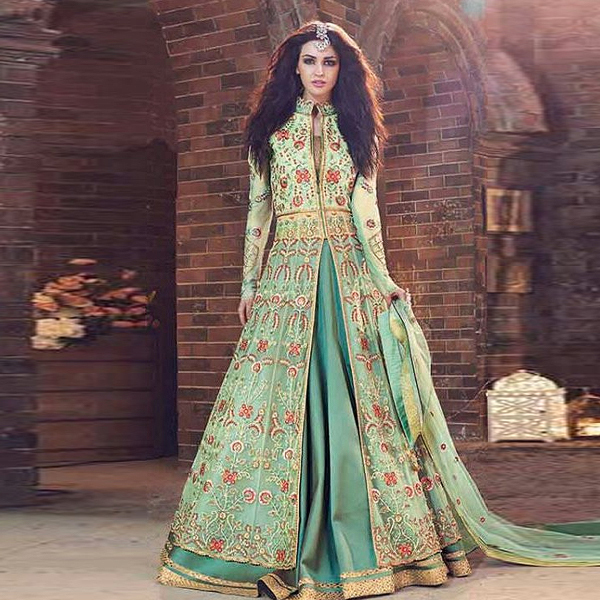 From party wear Anarkali suits, jacket style Anarkalis, Multi-layer Anarkali suits to Pakistani suits there is a wave of Anarkali suits to mesmerize the world. The humongous popularity of Anarkali suits is also notable for the fact that they go well for all body types. They have turned out to be the most loved conventional clothing for ladies of all ages and particularly of all body types. 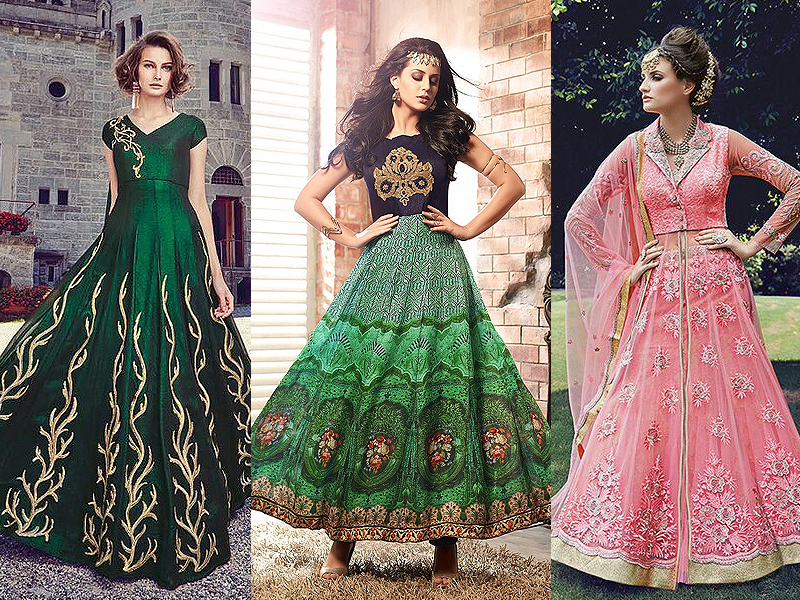 For a vigorously blessed figured woman, A-line Anarkali suits make for a petite appearance. 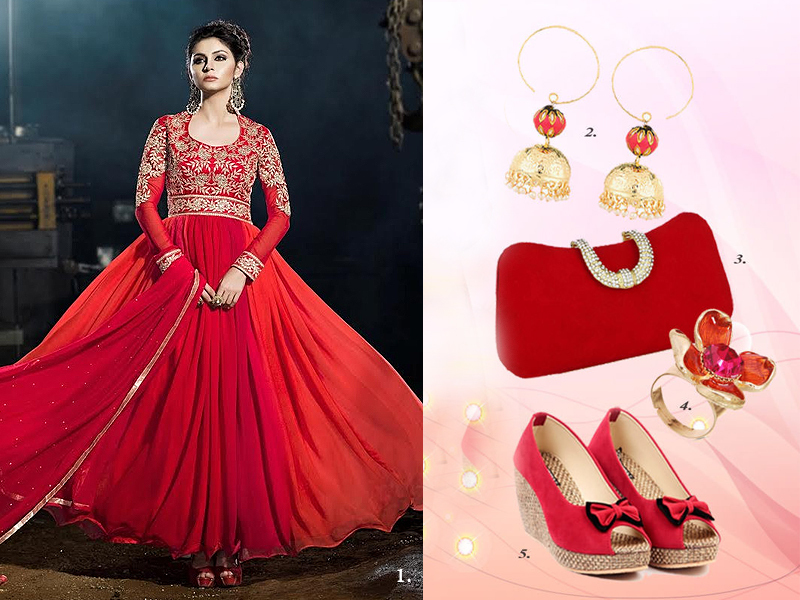 For a light and petite looking woman, dress style Anarkali are just an ensemble to choose for. It is one of the seamless beauties that Designer Anarkali suits showcase make them winsome and popular. They have an edge to other ethnic wear with the fine selection of rich fabrics flashing drop dead gorgeous embellishments and embroidered detailing. Among Asian designer wear they tag on the top place. In general, many are oblivious to the significance and how Anarkali suits originated, but now they can put their qualms at rest. So, Anarkali lovers after a sheer dose of information about Anarkali suits doesn’t your heart croon to buy one for yourself? If yes, comment below. Indian designer wear explores the roots attached to Indian craftsmanship and discover its best in its creation. The stunning collection showcased every year by designers has an essence for rich artwork that manifests the raw feature brilliantly. Having said that, women share a bond with everything that is ethnic yet rich and so we can contemplate looking for some more trendy designs to satiate our soul in the coming season. Indian ethnic wear is spectacular in defining an integral aspect. Being designed in such a beautiful way and popping out some intrinsic artwork, these are stupendously gorgeous. They have made their influence across the globe and all accounts to the value it adds to the outfit. It saves the true spirit of the person and letting her stand out apart from the crowd. No wedding could be completed without Indian wedding dresses. It all boils down to the fact that they have a charisma to offer. The trend changes with season to season but what remain intact is the grandeur and elegance they have to offer. Indian wedding wear embraces the bridal beauty and groom’s masculinity and here they get to live their wedding day to ages. It is right to say that weddings dresses are not for that special day, pull the best from your collection on festivals and in parties to power the change. If you are thinking that Indian wear is just boring, better get away from this disbelief. Indian ethnic wear is all things trendy today. They assure women love the designer pieces and share an affinity more often. That's why every year you may find some standing change into this niche of the fashion industry. They are stylish, trendy and enhance the beauty of women with much grace. Layered Anarkalis, palazzo suits, jacket lehengas are all the offerings of trends and how designers experiment with it. Be it that eclectic mix of outfit that has got the eyes to that gorgeous saree worn by an Indian celebrity during Cannes, Indian ethnic wear never fails to impress. Party wear sarees are the love for women and she receives high appreciations across the globe. There is a huge range of Designer sarees online and women get their hands on this without any bank breaking. It all sets to the beauty its shares and how well it is applauded. The impact of Indian wear is prominent and will continue to be the same as Indian wear is just love. Salwar kameez were originated back then with a rich history in hand. Worn by both men and women, it is a combination of kameez (shirt or top) and salwar (pants). In the Indian subcontinent, it is still worn by both men and women. The eclectic mix of designer salwar kameez you find today have roots attached with the basic shalwar kameez or salwar kameez. 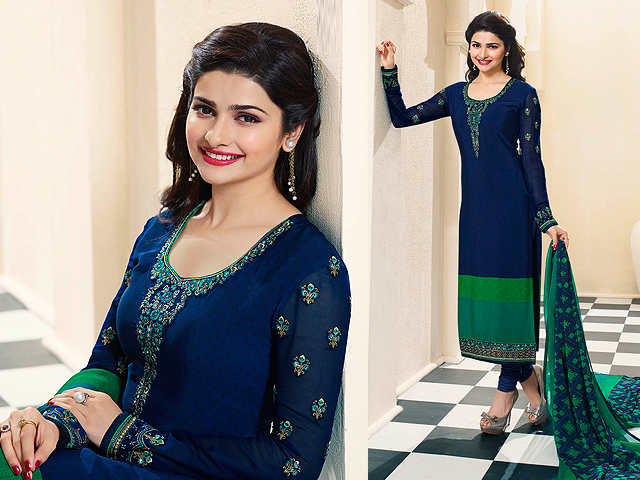 Unlike a tight pair of jeans, salwar kameez are high on comfort parameter. They are made of comfortable fabric that doesn’t itch you anyway and uplifts your comfort. Plenty of access cloth in the waist area is an added advantage. There are many variants of salwar kameez with churidar salwar, palazzo salwar and Patiala salwar being the major. All are appropriate for different body types. For tall and lean, Patiala salwar and palazzo salwar looks beautiful whereas churidar salwar looks stunning on all body types. Unlike Anarkali suits, salwar kameez are perfect in outlining the silhouettes. They outline the contours and curves of the wearers’ body and camouflage the negative features. Well, when it comes to money they are a deal to crack on with what they deliver. Spending on something that is worthy and let you shine in any wedding or occasion with an affordable money is high on ecstasy. Casual salwar suits, on the other hand, are a staple for many Indian women where they wear it regularly. Salwar kameez are extremely popular for their rich colours that enhance the beauty of this style of ethnic fashion. From solid hues to a harmony of colours, casual salwar suits are vivid in their colours and represent the vivacious colours of culture and traditions. Be assured when you are buying designer salwar kameez as a rich fabric enhances the texture of salwar kameez with brilliance. As a fine fabric depicts the richness of the garment, it is well illustrated in designer suits. Glorious artworks on party wear salwar suit enrich the beauty of the fabric and embrace the designer salwar kameez to its true terms. You will find hand embroidery, sequins, thread work and embellishments that make it a glittering outfit. Salwar kameez can never leave their fashionable statement. They are in fashion and will always be there. They are the roots of ethnic fashion and various forms of suits like palazzo suits, Anarkali suits and churidar suits are its subsidiaries. Whether it is designer salwar kameez or casual suits, you can easily take care of them. According to fabric and work on the suit, it could be hand washed or dry cleaned. For heavy suits, it is advisable to be packed properly with mothballs to prevent any damage. Indian is a country with a heart for a variety of fashion. Be it ethnic, western or indo-western you will find love in almost every piece or outfit. If you are travelling to India for the first time, you will be amazed to witness the eccentric yet colourful fashion that prevails everywhere. It certainly describes how colourful is India as a country. The clothing here depends widely on many factors, from climate, local conditions, religion and urban and rural settings. Everything plays its part in depicting the clothing. However, the roots can never be detached. Indian ethnic fashion was and still in the same stride of being extremely loved by the people. This nine-yard beauty called saree is a beautiful piece of ethnic fashion that is famous across the globe. It is usually patterned with drapes over the body. It is worn with a blouse and matching petticoat. It is the staple of Indian women clothing. That's not all; the draping of saree varies depending on the regions of the country. 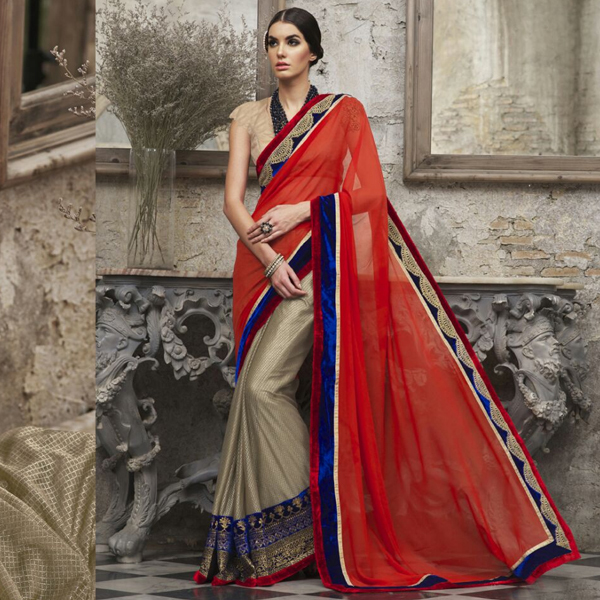 Sarees have evolved with various patterns and offbeat blouse designs that call for a real makeover. Salwar kameez is another form of ethnic fashion that got its roots attached to the Indian subcontinent. It is mostly worn by people in the northern part of India. The composition it is made of consists of “kameez" which is a shirt dress and a "salwar" which are basically trousers. A dupatta is carried with a salwar kameez. It is adorned together and comes out to be a famous piece of clothing across the world and among Asian women. Designer salwar kameez and Anarkali are also in high fashion notes among women. Lehenga choli is another kind of clothing women adopt in India. 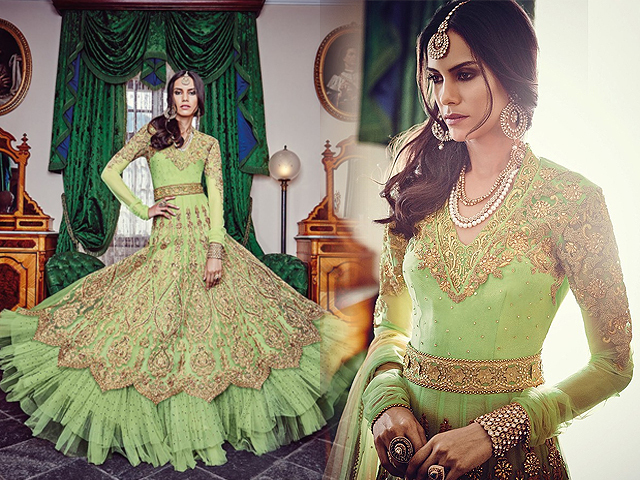 "Ghaghra choli" or "lehenga choli" is a beautiful outfit that embraces the vibes of India. It is basically worn by women of Rajasthan, Haryana. Gujarat and Madhya Pradesh. Lehenga is a long pleated skirt with embellishments and embroidery. It has a choli that is similar of a blouse and the look gets completed with a Chunari or dupatta. There is designer lehenga choli to regular wear cholis that are worn by women across India. The high labels unleash beautiful patterns and designs in this staple outfit. Kurtis or kurtas is simply a long shirt or blouse that could be both below and above the knees. This is an outfit worn by urban women for daily or office wear. It can be teamed with Patiala salwar or normal salwar, leggings or a pair of jeans. Kurtas are extremely comfortable and depending on the fabric they are worn in all climatic conditions. With many designer labels flourishing, Indian Designer wear kurtas are making a change in the life of women. A beautiful designer kurta can compliment her look in any party or wedding for that matter. Indian designer wear is simply enriching and ingest some true Indian vibes. Films have a great impact on the style and fashion trends that are followed in India. Dresses that Bollywood actresses adorn are often followed by the young girls in the country. Infact these dresses become the style statement conveniently. Though most of the actresses sport western wear in various award functions, film premiers or even during interviews; sometimes they adorn different kinds of Indian ethnic wear as well. You can see actresses in the most attractive traditional attires during Diwali, Eid and other festivities or personal functions, celebrations or rituals and religious affairs. 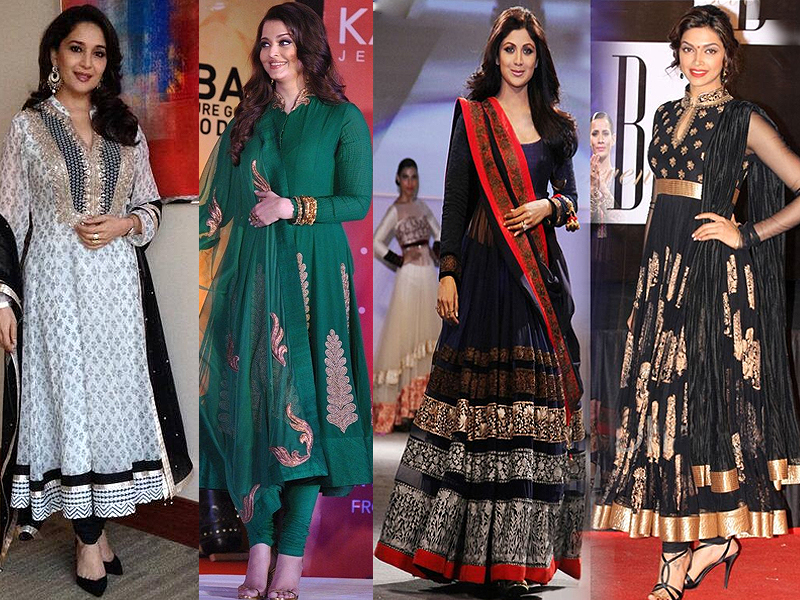 Anarkali suits have turned into a hot most loved with Indian actresses off late. The best thing about this costume is that it has stayed in a fashion quite some time for now and is still in great demands in the market. There is probably no actress in Bollywood who has not adorned this gorgeous and stunning outfit. Available in different cuts and styles, Anarkali can suit any body type and can make anyone look charming. Different actresses right from Madhuri Dixit Nene, Aishwarya Rai Bachchan, Dipika Padukone, Shilpa Shetty, Dia Mirza, Kareena Kapoor, Karishma Kapoor, Anushka Sharma, Sonakshi Sinha, Katrina Kaif, Sonam Kapoor, etc. have dazzled in Designer Anarkali suits made by eminent fashion designers of Bollywood and otherwise. Indian designer wear, whether it is a saree, an Anarkali suit, a salwar kameez or a lehanga, is made from wide varieties of fabric. Actresses purchase the item that looks good on them and which matches their personality and style. For instance, actresses who have tall figures would go for Anarkalis made of chiffon or georgette material as these dresses make one look slim and tall. Dresses with this material will not have much flare as well. Again, Anarkalis made of brocade, tussar, silk, cotton and other stiff materials will give a heavy and flared look to the costume. It depends on the choice of the actress and as well as on the occasion of which the dress is being worn. When talking about modern Indian party dresses, one dress that surely features on the list is none other than the Anarkali. Gorgeous and glamorous Anarkalis can be the perfect dress for any party. Since the dress is itself highly embellished and has elaborate decorations and embroidery, lots of accessories are not always required with the costume. Heavy earrings and bangles are more than enough. However, many actresses wear necklaces with the dress as well. Since this is an Indian traditional wear, carry a batua or Indian style clutch with the dress. Last, but not the least, wearing heels is mandatory with Anarkalis to get a perfect look. If you want to wear designed ethnic Indian wear like the Bollywood actresses, you can do so the same easily now. With the coming of various online stores dealing with traditional Indian wear, getting such costumes has become easier. Select the kind of Anarkali suit you want and place an online order for the same. There are also scopes of customising your apparel. Many stores also sell matching accessories and jewellery with the costume as a complete set. Browse through the various stores and select the dress that you think will suit you most. 1. The Royale Affair: How about sprucing up your wardrobe with some or more of matching. Yes, a bride and groom may look super stunning when they pair up with colors and patterns on their respective attires. The royal ensemble governs their ultimate importance and attention on their special day. Even the guests may try to collaborate with partners and look incredibly glorious. Kaseesh knits this bond with the amazing bridal anarkali collection, giving an opportunity for the ladies to dress up as their men do. 2. Indo western charisma: Indo-western gets the eyes of the not even young crowd, but even the oldies are swinging in with the theme of Indo-western with more joy. They are pairing their attires and unleashing trend to master by pairing up with their partner. The chic Indo-western outfits for men and women comes out making a delight for the audience and ingest a sense of love and affection among partners. Why don’t you try matching up with your partner this season, at least with your outfits? 3. The pattern Look: This is quite in this season where couples can make a real deal by draping in the same patterns. He can opt for monochrome jackets or blazers, floral patterns or some ethnic prints on his outfit. While women may look super classy by donning the same prints and patterns to go edgy. A monochrome sari or lehenga works exceptionally well to define an inspirational tale of love, affection, and of course trend. 4. Contrasting: We must be doing it for ages, but it is still nascent to all its form. Contrasting between couples is a major goal; after all, you cannot go wrong looking extra dramatic. You must know—“opposite attracts” and that is why you have all the reason not to wear the same color and patterns to look like a pair. Kaseesh has some stunning outfits that will do its part in making the right contrast with your partner. From the wide variety, you can make the right move. 5. The formal duo: You can never go wrong making a formal impression. A lovely navy blue suit set and your partner wearing the same shade suit and pocket square calls for a delightful combination. The pocket square may sport any color from red, hot pink, baby pink to coral that calls out for an impression to last. Find the best of ethnic suits and lehengas from Kaseesh and join the matching tales with your partner. Indian ethnic wears are varied and gorgeous. 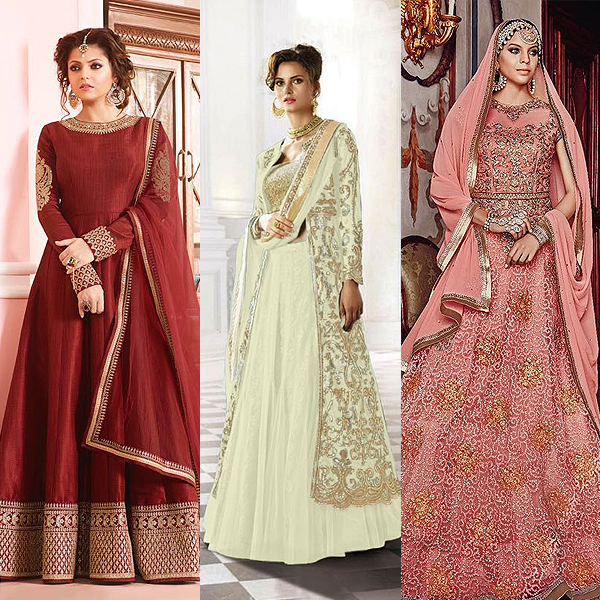 Whether it is the lehanga, the saree, or the sharara, the Anarkali suits or the salwar kameez – Indian women dazzle in all the above-mentioned costumes. But it is also true that such attires cannot be worn all the time and finally ends up in the wardrobes without being worn much. It is needless to say that these attires are pretty expensive and so investing in them again and again might not be possible. There are women who love to buy traditional attires like lehangas for almost all weddings and occasions that happen in the family. The result is that they have great collections of lehangas, but no other kinds of traditional outfits. So if they plan to wear something different for an event say a reception or an engagement, they have no other option left in front of them. Buying a new traditional dress right at that point might not be possible. What to do in such a situation then? Well, it is time to implement your creativity and workout something unique and innovative, which is stylish at the same time. Well, this is a really interesting thing that you can try with your lehanga. If you do not want to wear lehanga to every party you attend, give the dress a twist. This will help in multiplying your wardrobe without making extra investments for the same and also by not occupying any additional space in the wardrobe. · The blouse of the lehanga will act as the bodice in the Anarkali, while the lehanga will be the part that comes down from the waist into flares. Since the blouse of the lehanga is a tight fitting one, it will be perfect for the bodice of the Anarkali suit. · Put on the lehanga and the blouse as you would wear normally. But wear a churidaar or matching tights below the lehanga. See that the churidaar or the tights sync well with the color combination of the lehanga. Usually the colors used for the borders in the lehanga are perfect for the churidaar. · Now loosen the string of the lehanga and pull it towards the chest and set it right below the bust line. Make sure that you fasten the strings really tight so that the lehanga does not come down and you don’t need to pull it up again and again. Since the lehanga is normally heavy, it is recommended to take extra protection so that it remains intact in its place. · To conceal the string and the border of the lehanga, use a belt made of the same fabric or in absolute contrast color to be tied on the area where the lehanga is tied below the bust line. You can also use matching lace to create an attractive belt and fasten the same tightly. · To give a new look to the dress, you can mix and match the dupatta. Try and find a gorgeous dupatta with matching or contrast colors and with considerable embroidery or other embellishments. The dupatta should have some elements of either the Anarkali or the churidaar. Drape the dupatta in any style you want. It is a wonderful way to give the traditional lehanga a great trendy twist. Indian Street Style - What Girls are following? How are the Indian dresses different from those of other countries?